I got a lot of mails asking me about my make up in this picture which was taken on the night of the launch of the Miss Derry 2014 pageant. Most of you thought that I had had my make up professionally done but the truth is that I did it myself so I thought I would let you in on my make -up secrets and have a look inside my make up bag! The first thing I will tell you is that my make up routine doesn’t change much from day to night! I am one of those girls who goes nowhere without a touch of foundation, mascara and eyebrow pencil… I have to have my eyebrows! The only thing I generally do differently at night is that I add a few more layers of mascara and a touch of lipstick. I am not one for wearing eyeshadow, I feel it makes my eyes look smaller whereas with my long lashes I can make them look bigger and more defined through using mascara and some eyeliner (only on the waterline. 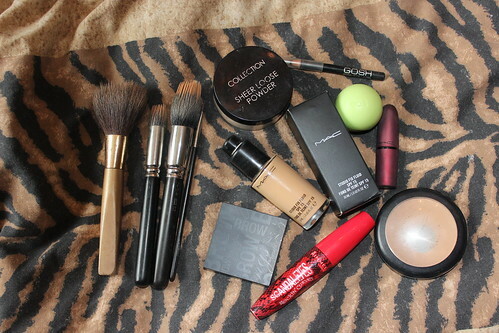 I also have a fascination with MAC makeup and their brushes which I swear by for applying foundation. I’ll take you through my routine step by step. 1. I never moisturise too close to applying make up, I like to leave about an hour in between as otherwise my skin goes too shiny. Instead I use a primer and my favourite is the Benefit Pore-fessional. It works really well to keep my dry areas hydrated and reduce shine as I have combination skin. 2. 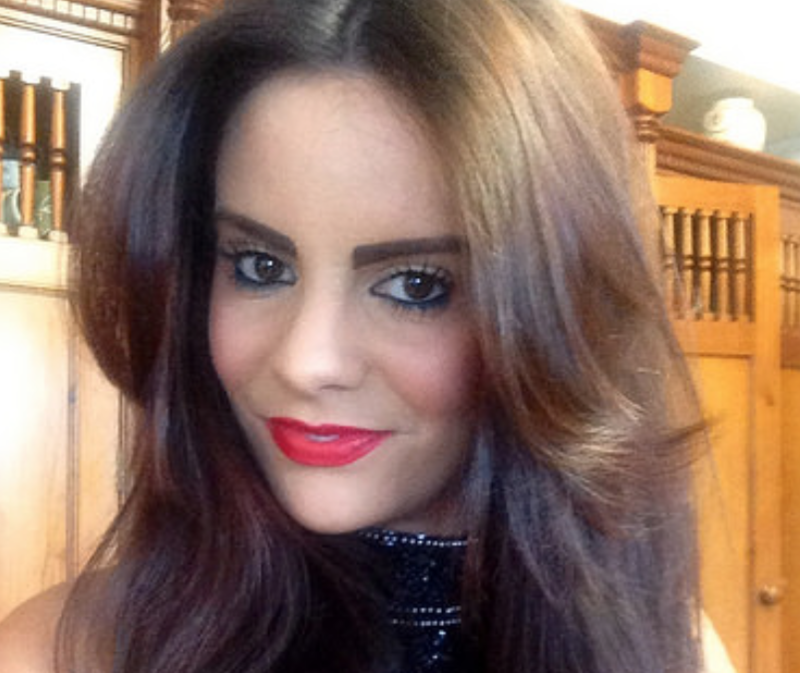 Foundation – I like loads of coverage in my foundation so I go for the MAC Studio Fix Fluid. I find that this works best for my skin. I also tend to swap colours depending on day or night or whether I am wearing fake tan. I wear NC25 during the day, NC 30 at night or NC35 if I am wearing quite a bit of fake tan. I know some people find this foundation a little too heavy but I find if you remove it all at night and use a primer before application it doesn’t damage my skin. 4. Eyebrows – I have to have my eyebrows filled in, otherwise I simply feel like I am in a permanent state of surprise so I swear by the Benefit Browzing palette. It has a shadow, wax, brushes and a tiny pair of tweezers, everything you need to get the perfect brow! Just ensure to pick a colour that matches your hair, you don’t want black eyebrows with bright blonde hair ladies! 5. Eyeliner – I always apply a line of black eyeliner to the waterline of my eye. I never put it on the lid unless I am going for a very dramatic make up look! I feel that the waterline really opens up my eyes and also gives a good base for my mascara. I find Gosh Eyeliner pencil the best as it doesn’t bleed or smudge and gives a solid black defined line! 7. Lip Balm – I always like to keep my lips hydrated, particularly when I will be wearing lipstick for a long period of time so I apply an EOS balm to my lips first! My favourite flavour at the minute is the mixed fruits but I like to change them depending on my mood! 8. Lipstick – In the above photograph I am wearing the Rihanna for MAC – Viva Glam red lipstick! I absolutely love it as it is bright enough to make a statement but very classy and elegant! 9. Touch-Ups – When I am heading out for the night, I always bring the MAC Full Coverage foundation with me. It is easier to use for touch ups than a liquid foundation and gives the best coverage of any foundation I know! It is quite heavy so I generally only use it lightly to fix any errors in my make up but its fantastic for any ladies, like me, who are conscious of their skin! and thats it, my entire make up routine summed up for you! If you would like to try out any of the products for yourself just click on their names and it will take you directly to where you can purchase them! Let me know if there are any other of my make up looks that you would like me to show you or if you would like a video tutorial!